Apple provide great entry‑level music software in the shape of Garageband, so why is Mac hardware shedding features that help entry‑level musicians? Apple: don't you just love them? Analysing why I continue to support their products reveals a combination of reasons, with no one factor standing out as the decisive one, but vying for top slot is their support for entry‑level musicians, the consumers who will become tomorrow's 'prosumers' and professionals. Software like GarageBand is far more powerful and creative than it needs to be for many entry‑level musicians, but this means it has the depth to be a perfect stepping stone into more serious music production. But the hardware that Apple sell doesn't seem to support the philosophy of reaching out to those with little or no experience, or at least not with any consistency. General rejoicing was heard when the white MacBook reintroduced the audio input socket, but the latest revision loses it again. Granted, the single socket provided is an output and an input, but what if I want to rock out on my guitar while wearing headphones? I could buy an audio interface, of course, from the many cheap options out there, but the whole point, surely, was plug in and play, not plug in, configure audio interface drivers, worry about latency, lose a USB socket, spend a couple of days on a forum trying to figure things out, and then play! The point I'm making is that Apple are making great software but it is currently proving tricky to access for newbies. You have to go up to the 15‑inch MacBook Pro to get separate audio input and output, by which time you're spending so much money that the cost of an audio interface is insignificant anyway. Perhaps I'm still failing to appreciate the genius of Apple's plan. As I write, they have announced huge profits in the face of a global recession. Mac sales are up 17.3 percent and Apple has 90 percent of the market share of PCs over $1000 sold in the USA. Expensive computers are where the real profits lie, so perhaps by hobbling their cheap computers Apple are (successfully) enticing us to part with more cash. Connections on the new MacBook: no Firewire, only one audio socket.But the issue does not stop at the entry level. Firewire 400 made a brief reappearance on the white MacBook, but that has now disappeared from the entire range. A single Firewire 800 socket is all that is offered on all MacBook Pros, iMacs and the Mac Mini, which puts musicians in a bind. 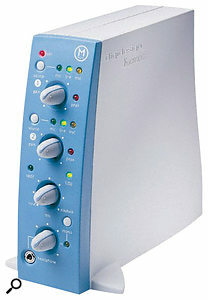 Most audio interfaces are still Firewire 400 equipped, so you either need an adaptor or to daisy‑chain from an external Firewire 800 drive that has a 400 port, which is far from ideal. Adding another Firewire bus is only possible on the 17‑inch MacBook Pro, via the ExpressCard/34 slot. Yes, you can buy hubs, and converter cables, and the multiple Firewire 400 sockets on previous iMacs shared the same bus anyway, so no performance has been lost, and doubtless there are design reasons for these decisions (such as battery size changes to meet environmental concerns). But a 27‑inch iMac with quad‑core processors is a very powerful computer in quite a large box, yet has the same connectivity as a 13‑inch MacBook Pro. So the Mac Mini, at $599, with almost identical performance to the white MacBook, is looking like a sensible option for entry‑level musicians, with separate audio in and out, five USB2 sockets and Firewire 800, and plenty of change left over for display, keyboard and mouse: good value if you don't need to be portable. Sockets available on the Mac Mini: Firewire 800 and five USB2! Somehow, Apple make all that money despite not (yet) releasing a notebook or a tablet. Recent developments, however, continue to suggest that the future of computing is remote, as in on a server somewhere. And our terminal is just that, a terminal to access data stored somewhere else. The Mac Mini version that comes with Snow Leopard Server looks like a great option for this approach to computing, so I'm going to refine my speculation this month, away from notions of tablets and netbooks, towards a touchscreen terminal for accessing the data on my server, and controlling my Apple TV. With WiFi/3G, it will be a remote control that can also browse the Internet and make phone calls while I put the finishing touches to my latest mix and upload it to the client's web site, all from my favourite armchair. Now that's what I want for Christmas! Digidesign have combined support for Snow Leopard with withdrawal of support for the original M Box, by releasing a pre-release version of Pro Tools called 8.0.3pr, which runs on Snow Leopard but doesn't work with the original M Box. This has enraged centres that teach Pro Tools, many of whom rely on classrooms full of original M Boxes, and who will now have to upgrade if they want to stay up to date with the latest OS. (To run 8.0.3 on Leopard, users are advised to wait for the final release version, as the pre-release version is not yet qualified on Leopard.) Power PC users are not supported with any version of this release and 8.0.1 is the last version of PT to work with Power PC processors. Potential users of the 8.0.3pr release should be advised that pr does not mean 'production ready' — it is a beta, whose discussion forum can be found at http://duc.digidesign.com/forumdisplay.php?f=53. The original M Box: goodbye old friend?The M Box issue will doubtless grumble on, but we need to remember that to be involved at the bleeding edge of a technology-based industry we'll have to invest some cash from time to time. Digidesign have to balance the need to keep pace with the Apples of this world with the need to deliver rock-steady professional performance from their products. The pace of change is increasing, but it is still our choice whether to ride the wave or watch from the beach.